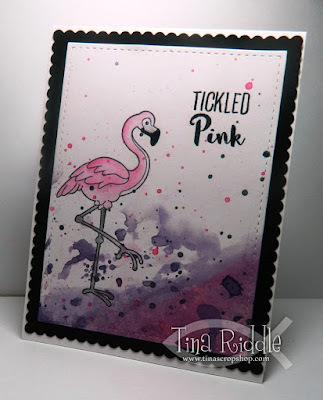 Tina's Crop Shop: PCC 228 Color Challenge - Tickled PInk! PCC 228 Color Challenge - Tickled PInk! Hello and Happy Hump Day! 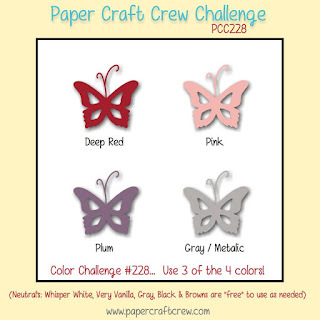 You know Wednesday means time for another Paper Craft Crew Challenge and this time it's all about color! Just pick 3 of the 4 colors in the Challenge Badge and create a new project! I LOVE these colors! I chose to use Pink, Plum and Gray and finally got a chance to ink up my Fun Stamper's Journey stamp set called "Tickled Pink". I used distress inks and the ink smooshing method to apply my Picked Raspberry (Pink) and Seedless Preserves (Plum/Purple) to a piece of Strathmore Smooth Bristol Cardstock. Once it was dry, I used my Misti to make sure I got a good Image of my Flamingo with Stampin' Up! Archival Black Ink. I used a Tim Holtz fine tip Aqua Painter to watercolor the Flamingo with Picked Raspberry and Black Soot Distress Inks. I used my heat tool to make sure it was dry. I then put my Bristol panel back in the Misti to stamp my sentiment with more of the Stampin' Up! Archival Black Ink and once I had a good dark impression, I clear embossed it. Finally I used Mama Elephant Creative Cuts to cut out my Flamingo stitched panel. To finish off my front panel, I used some Fun Stamper's Journey Silver Silk to make some silver splatters and my Ranger Distress Splatter Brush to splatter some of the Picked Raspberry Ink that had been watered down. Once again I used my heat tool to make sure the entire panel was completely dry. I cut a piece of Stampin' Up! Basic Black cardstock with the scallop edged die from the Mama Elephant Creative Cuts set to back my front panel. Once that was adhered, I glued it to an 11" x 4 1/4" Neenah Crest Solar White 110# Cardstock that had been scored at 5 1/2". Great card!! Love all the layers and the look from the smooshing technique is awesome!! SIP Challenge #84 Tic-Tac-Toe - Otterly Love You! SIP #83 Sketch Challenge with Love To Go! OSAT Blog Hop - No Rules New Year! PCC #226 I'm Bringing Birthdays Back!